Warning! This is a new Home burglary trend! Traditionally house breakings happened between 8am and 1pm because that was the time that most people went to work or school, leaving the house an easy target. More and more home burglaries are now happening between 6pm and 10pm in the evenings when you are home and awake. This is a new criminal trend. Analyzing the data from Statistics SA, according to an article by The Herald Live, South Africans are more likely to be the victims of crime in their own homes than anywhere else. The installation of alarms, hiring of security response companies, trusty burglar bars / burglar proofing, vigilant neighbours and neighbourhood watches made homes more secure and more difficult to break into during the day. Criminals are always adapting and always trying to find weak spots when people and their homes are at their most vulnerable. Innocent people are now being targeted when they either arrive at home or while they are busy having dinner or watching TV with their families. You also hear of stories where the criminals are actually targeting people busy entertaining on a Saturday night. Why? The answer is really simple. Criminals are not scared of the number of people in a home anymore, because if they catch you off guard, they can easily overpower you and your family or guests. What is more is that you have less time to respond or alert someone. People think that if there is ‘activity’ happening inside the home, burglars and criminals won’t come in. But they actually sometimes target these homes specifically for the easy access and unaware residents. When you arrive back from work, you either switch off the alarm or open the security gate to gain access to your property. Criminals spy on you. They document your ever move and they find patterns. Break-ins are hardly a spur of the moment thing anymore. With all the security put in place, intruders have started to plan more. When you eat dinner or watch TV, people leave their doors unlocked; their sliding doors open and let their children play outside till it gets dark. In summertime the sun goes down later, which means that people braai or are outside more, leaving the house and themselves unsecured. Entertaining guests in the braai room, patio or under a lapa, especially at the back of the house or away from the front door, makes other entries to the house easier accessible. People leave their doors open because the kids run around or they are waiting for more guests to arrive. Music is playing loudly and everyone is chatting away so the chances of you hearing uninvited guests entering your property are slim. So what can you do? The obvious advice is to be more attentive and observant when arriving at your house. Another idea is to drive past your gate once, just to see if there is something suspicious like someone following you or waiting at your gate. It might also be good not to stand with your car’s nose facing the gate but to stop at a parallel angle so you can drive away easily when a threat arises. Always be cautions and aware when the gate closes. If you come home late, it might be a good idea to ask your security response company to wait at your gate to secure you entering your property. However when you are watching TV or eating dinner with your family on a normal school night, make sure you have Maxidor Security barriers, Security Doors, Trelis Security Doors, Burglar Bars, swing gates and expandable security gates installed. The security doors and gates can still give you the outside feel but place a physical barrier between your family and the intruders. These gates buy you the time you need to act in a potentially dangerous situation. The slamlock system enables you to just slam the door behind you in the event of running away from the threat. Some gates only take a few minutes to break into. Maxidor security barriers are made with the best quality steel. The burglar bars, security and expandable gates are installed with only the best locks and fastened with chemical fasteners into the wall, making these the safest barriers and gates on the market. 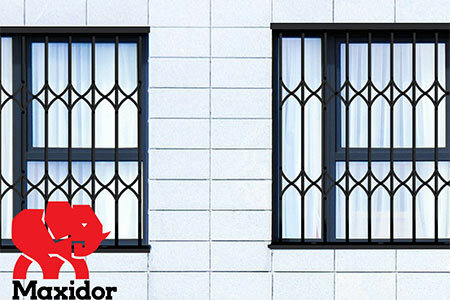 Maxidor’s core business is security barriers, burglar proofing your homes and businesses for over 35 years. Keeping up to date with security trends and the changes of criminal behavior are a few of the biggest issues our management team focuses on, on a daily basis. For more information on our wide variety of superior quality products, visit our website www.maxidor.co.za or call our offices for a speedy quote 0860 131 131.